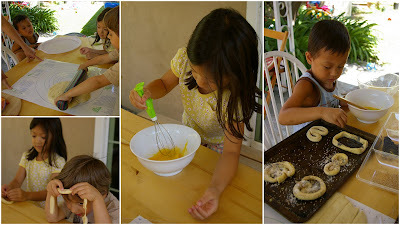 Cook Play Explore: Playdate Special: Baking Camp, Pretzels! Playdate Special: Baking Camp, Pretzels! Summertime, and the living is easy... and not so hot here. Kids are playing well and happily but are looking for something else to do, other than the obvious water-based fun. The solution was: Baking . It took me a while to decide exactly what we would make and bake, but the idea of preparing dough in the backyard seemed to me a nice one. Or, at least, a neat one: Crumbles and flour are all so very welcome to fall on the patio floor. But what to make? Cookies were too sweet. Bread? Nope. Brownies? No way they would not be convinced of eating lunch. After consulting some of my books I found out one recipe that was looking infallible. Nobody wants to see kids frustrated with an vague result. And what could be more fun than preparing your own pretzel? The project looked irresistible: besides the basic recipe, the Preschoolers and Pre-Ks would shape the pretzel and sprinkle with their favorite top. On the side, three types of dip (salmon cream cheese, bruschetta and cilantro cream) would provide the other needed nutrition while a summer drink and some slices of cucumber would guarantee that also the moms would love the playdate. The basic recipe for the pretzel is from Emeril Lagasse. I know that his baking recipes work wonders. I also tried a variation with wholemeal flour that didn't work so fine. It didn't raise enough and its texture was not looking or feeling right. What follows here are some steps to steps of how to prepare the "bakery" so that the kids will enjoy the process and eat them all! 1. On the night before the playdate, put all ingredients on the counter, and read the basic recipe again to make sure that nothing is missing. Add to the list ingredients that might work to coat the pretzels. Here we used poppy seeds, sesame seeds, grated Parmesan cheese and kosher salt. 2. About 3 hours before prep time, mix the dough and let it raise. 3. In the meantime make sure you have all the necessary gadgets available: Rolling pin, egg whisker, mixing bowls, pastry brush, ruler or pastry mat, a clean surface that they can roll the dough. 4. Check that everything is lined up before inviting them to start. Right before going to the working table or counter, remember them to wash their hands well. 6. Reserve tools and ingredients for each part of the process: first dough to be flattened, than the measuring and cutting part, then shaping them, painting them with egg. Positioning the pretzel on the baking sheet might be tricky, so it's better to do it before egg-painting and sprinkling. The sprinkling time is at the very last moment to finish. 7. After removing from the oven, let the pretzels cool down a little bit, to avoid the complaint that "Mama it is too hot to eat". 8. Enjoy your own pretzel while kids are proud to eat their own work of art dipped in their favorite spread. Anna, fiquei muito feliz com a visita. 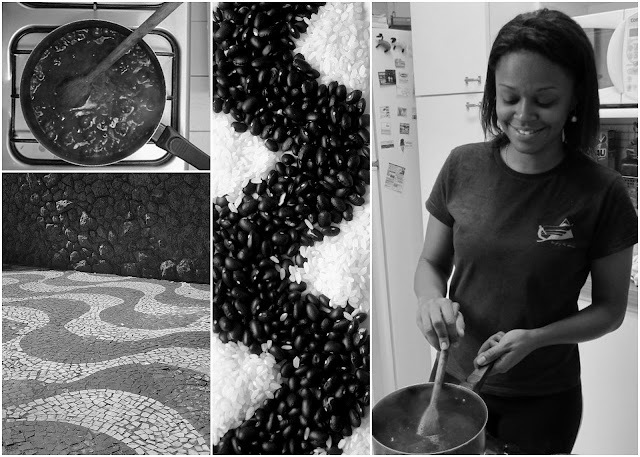 Não tinha reparado que este blog era feito a 6 mãos e que duas delas falam português :) A limonada saiu uma bela surpresa e adoramos cá em casa. Many thanks to Darienne for the aromatic limonade she suggested. What could be better than homemade backyard pretzels? They look divine! Serving the dips on the side is a great idea – where could I find the recipes for those? I bet the kids had heaps of fun making them - it’s almost like craft combined with cooking. Research shows that kids who cook and eat with their families are more likely to have a healthy diet and do better in school than their peers. They also learn life skills, including math, teamwork and communication skills. That’s why I work with the nonprofit group behind Healthy Monday. They have a series of public health initiatives, including The Kids Cook Monday, which is their newest campaign. It’s a weekly chance for families to spend time together focusing on their health and food. Please find out more here: http://www.healthymonday.org/the-kids-cook-monday/. We’re looking for family oriented blogs to help spread the word about The Kids Cook Monday movement, by publishing weekly posts on Mondays. If you’re interested in helping out by doing weekly posts, please contact me at mondaycampaigns@gmail.com. Carly, thanks so much for your comment and invite to the Kids Cook Movement @ Healthy Monday. I will send you a email about that asap. About the spreads: I will post soon a couple of recipes during this month and will let you know. One is a kind of fresh tomato sauce and a yummy smoked salmon cream cheese homemade spread!